After starting as a 5-year-old in New York, Driscoll eventually ended up in Kansas City and at the O’Riada-McCarty-Manning Academy of Irish Dance - what was then the only Irish Dance school in the KC area. Established in 2010, Bridgid Driscoll saw, according to the official website, “a need for a fun, encouraging, and creative atmosphere for Irish Dance in Kansas City”. Having danced with Irish artists such as The Chieftains and Eileen Ivers and competed at a championship level, Driscoll went on to establish the Driscoll Dancers performance group in April 2010 and began teaching her own classes that June. She also served as principal dancer at the Ragland Road Irish Pub in the Kansas City Power & Light District for two years. After it closed in late 2011, she began focusing on opening her own studio. And after an eight-month search, she found her current Shawnee location, less than a mile from her home. Classes at the Driscoll School of Irish Dance (DSID) are available for 3-year-olds to adult. With classes for dancers from beginner to championship level, in both solos and teams, there are opportunities for continual growth for both students and the school’s teachers. The school’s teachers are certified TCRG’s with An Coimisiún le Rincí Gaelacha (The Irish Dancing Commission) in Dublin, Ireland. The DSID Dance Center is located at 12418 W. 62nd Terrace, Shawnee, KS. This entry was posted on Monday, March 11th, 2013 at 1:20 pm and is filed under Irish Dancing. You can follow responses via my RSS 2.0 feed. Both comments and pings are currently closed. I am the director of St. Joseph’s Early Education Center. 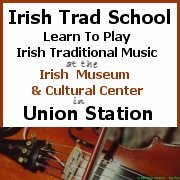 The children will be in class for St. Patrick’s Day, including our extended day program, and I was wondering if you could give them a demonstration of Irish dancing to celebrate the day. We would publicize the visit and be glad to invite parents to view the performance. Please email or call me at 913-248-4589.